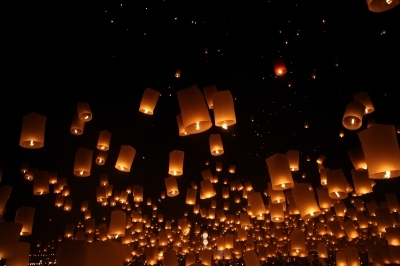 A clerk at the Tern Hill Hall Hotel told UK newspapers that the launch of Chinese lanterns for a wedding reception was behind the mass sighting of UFOs by soldiers and civilians on June 7, 2008. However, some experts disagree. Even if the lanterns were released as claimed, they would have been too small to account for the objects that were witnessed, photographed and filmed. Mark Hanley, a British UFO Researcher says that he has investigated many cases involving the release of Chinese lanterns. for the objects that were witnessed, photographed and filmed. has been cited by local fire authorities on previous occasions. sightings is a question that literally remains up in the air. the case if what came at the helicopter was a Chinese lantern. battery powered light would stand out." a Chinese lantern in any way, shape or form. but do not hold other news stories to that same standard. 'UFOs' spotted over San Francisco, Brooklyn - PHOTOS: UFOs, acts of nature or hoaxes?